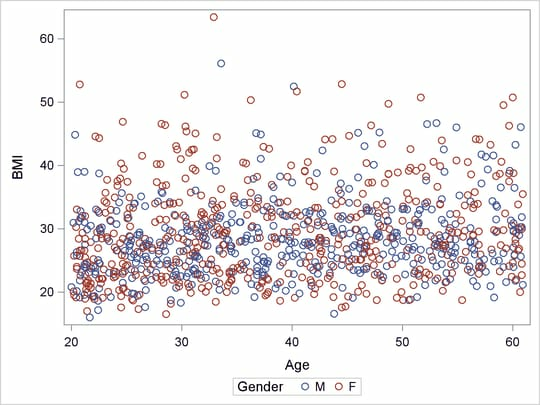 The following data set contains 526 female observations and 474 male observations sampled from 2003 National Health and Nutrition Examination Survey (NHANES). Each observation is composed of three values: BMI (body mass index), Age, and Gender, measured for subjects whose ages are between 20 and 60. Output 80.4.3 shows the parameter estimates and the diagnostics summary produced by PROC ROBUSTREG with the S method. In contrast to OLS, the robust p-value=0.5573 of the Gender coefficient indicates that the Gender effect is not significant. The outlier diagnostics based on the S estimates find 19 outliers that are assigned lower weights by the S method than by the OLS method. In the reduced data set, 71 female observations and 29 male observations are dropped. Output 80.4.5 and Output 80.4.6 respectively show the refitted S and OLS parameter estimates, and Output 80.4.7 displays the fitted curves on the reduced data set. 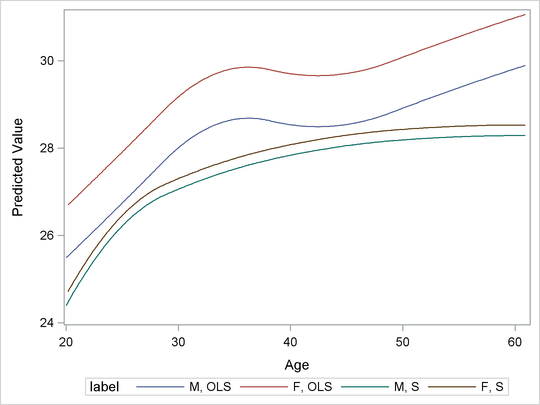 You can see that Gender is no longer significant for the OLS model, and the OLS turning pattern has also disappeared, but the new S curves do not change much from the previous ones. 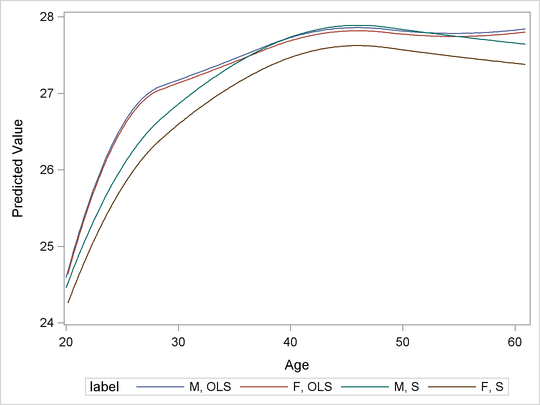 The OLS BMI by Age curves in Output 80.4.7 are closer to the S curves than to the OLS curves in Output 80.4.4. This suggests that indeed the difference between the OLS and S estimate results are due solely to the influence of the outlying observations.